“The clocks have safely arrived today, many thanks. Both clocks will be gifts and I am quite sure that they will be well received; they look superb! The packaging is also exemplary, exactly as per the video on your website! “Your website popped up first in Google, the website design was amazing, the clock has just arrived and it’s clearly been packaged with so much care, you guys are great. “Received the clock yesterday and absolutely love it! Think my parents will love it too. “My friend and her husband loved their vinyl clock. She told me couldn’t wait to get home to put it up on the wall. “Just to advise that I have received my order and I am really pleased with my purchase. The packaging was faultless, as I was nervous, about how it would be packaged and about damage in transit. “Absolutely love my clock thank you very very much! “The lovely Waterloo clock went down a treat…. “Birthday clock is GREAT and my daughter loves it. Many thanks. 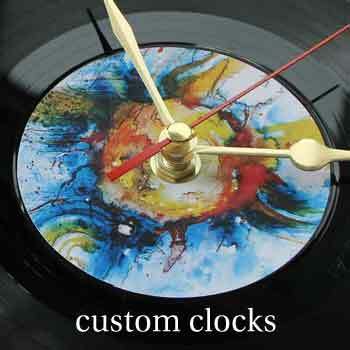 “I was looking for a clock made from a vinyl album for a gift and came across Vinyl Clocks online. 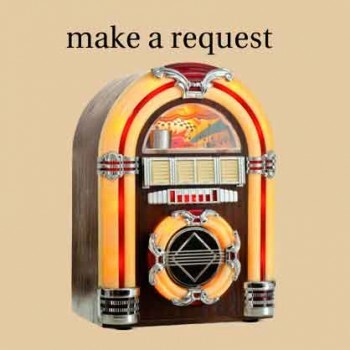 Although they have a great range on their website, I had my heart set on one album in particular – Santana’s Caravanserai – and so e-mailed the team to see if it could be done. I got an almost immediate response from them saying they would look into it and, lo and behold, the next morning they confirmed to me that, yes, they could make my clock. The clock itself arrived about a week later, very well packaged so there was no chance of damage! It looked great and was exactly what I hoped for. “Thanks for the Peter Gabriel clock I ordered, my husband loves it. He’s put it up in his music studio for all to see. “The clock (Madness) arrived safely this morning, thank you. It will be a stocking filler for my wife at Christmas. 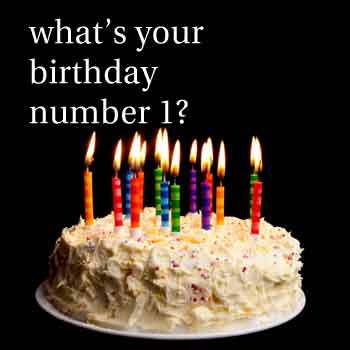 It became our song when I trudged through a snow storm to see my wife 2 days after meeting her at Christmas 1982. Her mum said it must be love so we bought the record. I proposed 6 days later and we married within 3 months of meeting! My wife loved the clock, there were a few tears then a short rendition of the song followed by a telling of the story of “our song” for the benefit of our son’s girlfriend. It has almost been decided that the clock will go in our new motorhome when we get it as we spend more time there than at home. “I ordered a vinyl clock from the company for my boyfriend for Christmas. 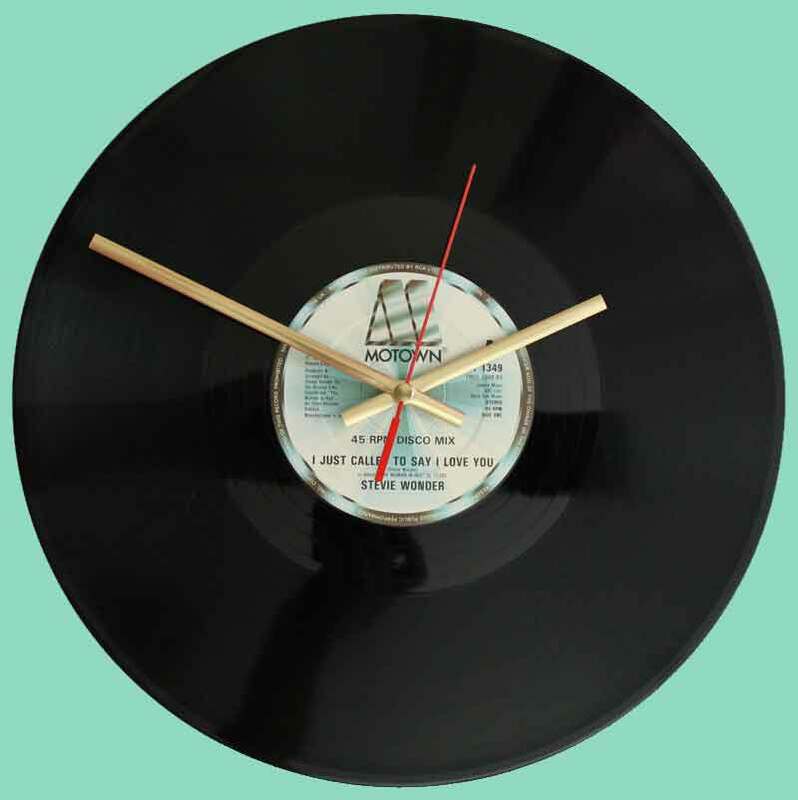 I enquired about the possibility of a more dance orientated record and was asked what I wanted; one of the records was ordered for me and made into a clock in plenty of time for Christmas. “Thank you so much for the outstanding customer service, which really was second to none and the lovely clock was very well received as a Christmas present. I really do appreciate your helpfulness, patience and efficiency with this special order, and I will most certainly be recommending you to friends and family. “wow excellent service! Well impressed with packaging, the service & end product !! “The clock arrived safely this morning, thank you. Name withheld until after Christmas! Thank you for your exceptional service, and I wouldn’t hesitate on recommending you to others!! And I have no doubt I will be placing additonal orders in the near future again. I look forward to having dealings with your staff and yourself again. “Just thought that I would let you know the reaction that I got from my brother Peter on receiving the “Weavers Green” album vinyl clock! He rang me straight away and said that he was absolutely “over the moon ” with his “Weavers Green” vinyl album clock! It was good that you sent directly to him with the “gift” message inside as he may have guessed who it was from if I had sent it from my address……I think it all added to the mystery! As you know I was in “Weavers Green” with my brother and Jane Hugg and Nick Hugg (cousins of Mike Hugg as in Manfred Mann) and we appeared on “Opportunity Knocks” the “X” factor of its day, made numerous television and radio appearances and we released several singles and the “Weavers Green” album via CBS. The vinyl and label were in excellent condition and it was great to receive the original sleeve as well! “Received my clock today and it is brilliant. Exactly as advertised and superbly presented and wrapped. “Hi guys, just wanted to say a massive thank you for the Bon Dylan vinyl you made as a wedding present for my now husband!! He absolutely loves it and the reaction was so much better than if I had bought him a watch!!! I will definitely be recommending you to others, regarding the quality and speed of service. “Thank you very much for the vinyl clock I ordered, it’s exactly what I wanted & I am sure my father will love it too (it’s his birthday present). “Just wanted to say, I received my clock on Thursday. I am absolutely over the moon. “Just to let you know the wife loved the clock! We got married 6 months ago, and this was the track for our first dance. All received. I’m utterly speechless. They were packed beautifully.. I even got frustrated getting into them i was so excited!Lol. Absolutely beautiful! They are going to make her very happy! “He absolutely loved his clock……perfect for a “should have gone to Specsavers” optometrist! “Many thanks for posting the clock so swiftly, it had arrived when I got home today. Thank you very much for sourcing this and dispatching it so promptly, it is much appreciated. I am very impressed with the service you offer I will certainly recommend you to my friends and family. “Just a quick one to say the clock arrived this afternoon and I absolutely lovef it… and so will the birthday boy! (Admittedly I wish it were a gift for me). 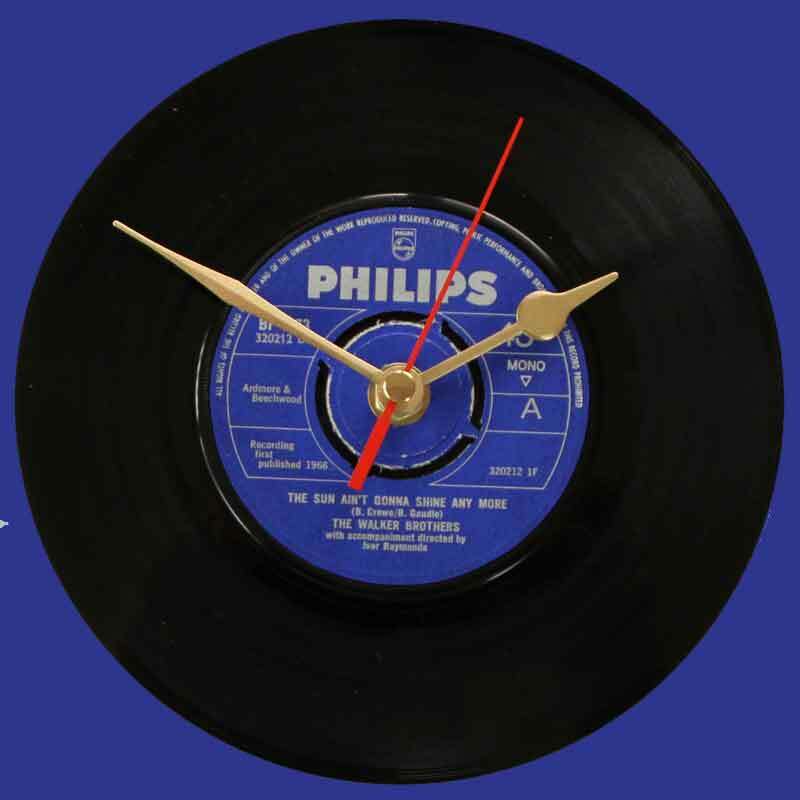 “Vinyl Clocks are one of those rare gems in the business world where good old fashioned customer service is their driving force (next to their beautiful product!). I have never had such fantastic service from another retailer, online or otherwise. Vinyl Clocks are truly amazing. I was after something really unique and special and they found it – they are modern day treasure hunters. “My sister absolutely LOVED the vinyl clock you made for her. It really was the perfect gift; it’s very personal and very cool at the same time! The clock looks amazing, and I got some questions from family and friends about where I got the clock from, so you might be expecting some more customers over time! Also, I’d really like to thank you again for the fantastic service. I know I gave you a pretty tough deadline to work with and I really appreciate how you not only made the deadline with several days to spare, but also that you kept sending me updates on the progress.